Leeds Rhinos remain bottom of Super League after slipping to their seventh defeat in eight games this season against Catalans Dragons in Perpignan. Leeds winger Ash Handley ran in three tries for the visitors, Konrad Hurrell getting the Rhinos' other try. But he was outscored by home winger Fouad Yaha, who scored the last of his four tries with seven minutes left. Catalans, thrashed 46-0 by Salford in their previous home game a fortnight ago, climb to fifth in Super League. Lucas Albert got the hosts' other try, while Sam Tomkins landed three of his conversion attempts. Liam Sutcliffe also kicked three goals for the visitors, from two conversions and a penalty. Leeds, who have now lost five Super League matches in a row, went bottom of the table following Huddersfield's Friday night win over Hull KR. 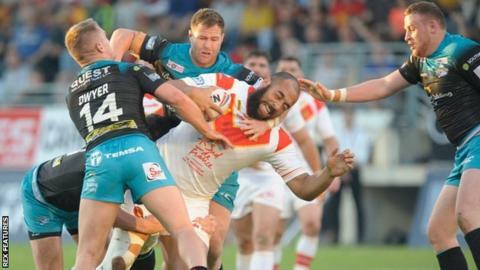 It was Catalans' second successive home win over Leeds following a 33-30 win against the then reigning champions in 2018. After scoring first in the corner through Handley, the winger then raced 90 metres to touch down under the posts before Catalans got on the scoreboard. Tomkins was held short of the line and Yaha picked up the ball to burrow over from a metre out on the left. Leeds extended their lead on 23 minutes, when an Albert error close to his own line was punished when Sutcliffe, Catalans old boy Richie Myler and Walker combined to send Hurrell over. After Sutcliffe missed the conversion from out wide on the left, new Catalans signing Sam Kasiano then came off the bench for his debut on 28 minutes and made an immediate impact. He won the penalty to allow his side to attack the line, then picked up from acting half and sent the ball to the left for Yaha to touch down in the corner. After Leeds forward Brett Ferres was sin-binned six minutes before half-time for a tackle with the knees on Matt Whitley, Catalans took advantage of the extra man. Albert picked up to touch down to the right of the posts. Tomkins adding the conversion for a half-time score of 16-16. With Ferres back on, Handley fended away Lewis Tierney with ease to complete his hat-trick in the corner soon after the restart before Catalans took the lead for the first time on the hour. Tomkins and Brayden Williame combined down the left to send Yaha over in the corner. Tomkins converted from the touchline to make it 22-20, only for a Sutcliffe penalty to level again, before Yaha had the last word. "It was a step back. I'm really disappointed with our performance to be honest. We found a way to win, which I'm pleased with, but the performance I'm certainly not happy with. "It's an important two points, make no mistake about that. But some of the things we did were criminal. I've certainly let the players know about that now. "Leeds will come good. They are packed with talent. They're going to find their form soon. I know how quickly it can change and if Leeds keep working hard as that, it will change for them. "We won two from our first 11 games last year and we ended up winning at Wembley and having a successful end to the season in the league." "I loved the way that we attacked the game. We made some changes to bring a bit more energy and a bit more control. "First half we were close to completing at 100 per cent but second half I think we had three, what I would call, major errors out of yardage . "That gave them a little bit more energy and that was probably the disappointing part. But we never stopped trying. We've just got to learn to close those games off. "We got a few penalties against us. I'll never look at that as an excuse but that's two weeks in a row that's really hurt us." Catalans: Tomkins; Yaha, Langi, Wiliame, Tierney; Gigot, Smith; Casty, Albert, Bousquet, Edwards, Whitley, Goudemand. Interchanges: Da Costa, Maria, Baitieri, Kasiano. Leeds: Walker; Briscoe, Watkins, Hurrell, Handley; Sutcliffe, Myler; Peteru, Dwyer, Oledzki, Ferres, Smith, Merrin. Interchanges: Jones-Buchanan, Singleton, Holroyd, Parcell.